Many barriers would be at play when the thought of upgrading or migrating your existing e-commerce store comes to mind. This is the quandary that many existing Magento e-commerce users or even the ones planning to get to a new Magento 2 platform definitely face in the current scenario. But for us being on the frontline of all the latest development, we can definitely vouch for Magento 2. The recent ‘Adobe’ acquisition of Magento 2 has only upped the ante for businesses looking to board the ship. The horizon on the other end definitely looks bright. This article is intended to make the e-commerce businesses realize that the problems they are facing is a clear and present danger, and the migration phase is not an option. 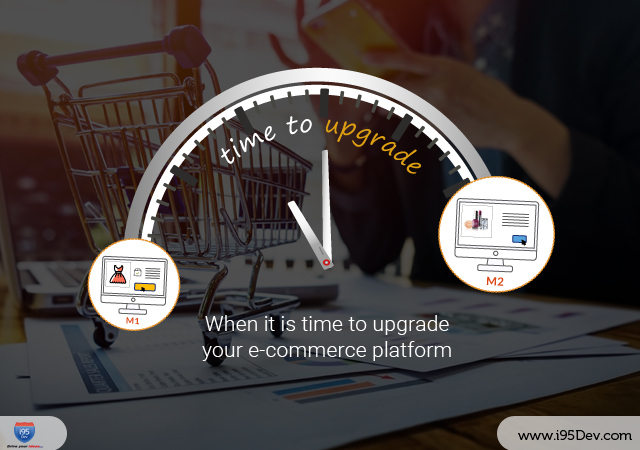 We also intend to help them identify if it is time to upgrade your e-commerce platform. Check out if the points mentioned below are the problems your business have been facing and let us know. This is a major red flag that e-commerce business mostly tend to overlook. With plenty of options available these days, getting a functional e-commerce store up and running is a child’s play, well at least that’s what most claim. However, it is not that simple, there is a lot behind the face of it. These platforms will quickly turn into a white elephant, with virtually no upgrades available and the platform itself not able to match to the evolving standards. The ability of Magento is the user community it has around it which is active, but the same does not apply to its contemporaries. So if you are on an e-commerce software and are left on high tides due to these problems it is better you start considering migration. An e-commerce platform is no good when all the gains you have in a business is spent on fixing the rickety system. There are plenty of such platforms, which are easy to be started and deployed but cost a fortune to simply keep it functional. Apart from maintenance of your e-commerce platform, there are other issues such as increasing subscription costs, commissions on the sales done through the platform, hosting fee, security upgrades fee, etc. All these add up to your overhead expenses and this is a very common factor in the proprietary form of e-commerce platforms. If you are an e-commerce business facing the heat of increased and uncontrollable expenses it is a major red flag. You should definitely contemplate migrating to a better platform. Look for a platform which has great hosting providers or even better gives you cloud hosting (check out Nexcess), which can give you regular access to upgraded security patches and even have a thriving community of developers who can provide you customized and out of the box solutions suiting your specific business requirements. The sign of a growing e-commerce business is the burgeoning sales and business orders it executes. However, is your current e-commerce platform able to handle your business requirements? A major factor that is required of an e-commerce platform is its ability to scale easily. While your current e-commerce platform may have got you to where you are, it is not right to expect the same when you grow. If you have been experiencing server downtime, slower page loads due to increasing catalog size, more returns, errors in managing customer data, etc. Then it is definitely time to contemplate migrating to a better platform which is not only secure but even scalable. This time we suggest you look for an e-commerce platform that could integrate with your ERP, PIM, CRM, physical stores, WMS and POS easily. This gives you a completely connected e-commerce ecosystem which is absolutely necessary in this omnipresent and omnichannel world. We have deep expertise in helping e-commerce players create a connected ecosystem. All said and done, e-commerce is a sphere, which thrives on UI/UX. The ease of shopping experience you are able to provide depends a lot on the e-commerce platform you have chosen to go with. The e-commerce platform that you are on would have been a great tool in its heyday back when you started your fledgling business, but is it still relevant now? Is it even catching up to the all the rapid strides in the e-commerce space? If you are facing higher bounce rates, increased instances of abandoned carts, not able to increase your average order value or even worse bleeding money through loss of sales. It is really related to your customer experience of the site and you should definitely be thinking of migration to a better e-commerce platform. Choose an e-commerce platform that would give your business the latest tools of the trade, like the persistent shopping cart, advanced full page caching option, which reduces your page load, ability to cross-sell, and up-sell based on historical customer behavior. The above content is based on our experience helping numerous client. Our team will be happy to look at your business and provide a free consultation. Contact our team at info@i95dev.com. Have you read our previous blog on what are the challenges of an e-commerce manager?